Jade is an interesting gemstone, the name in reality includes two gems - jadeite and nephrite. While nephrite is a found in many locations in the world, jadeite is rare and is commercially mined only in Myanmar (formerly Burma). The RG236 Kaisilver green jade ring features a natural jadeite gemstone. Our gem experts procure this gemstone from the Kachin area of Burma. There is a general belief that jade is always green but, nature has blessed us with jade in various colors. We can craft a jade ring for you with a green, lavender, white or black jadeite gem. It is important to understand that, there is nothing like black jade - it is basically very dark green jade with low translucence. The combination of a claddagh ring and green jade is an awesome idea. The claddagh ring which is often referred to as the 'hands heart and crown ring', has a history that dates back to around 4 centuries. Those were the days when slavery was rampant. The first claddagh ring was in fact made by an Irish slave for his beloved. The young man named Robert Joyce wished to express his true love for his beloved, through the features in the ring. The hands depict friendship and togetherness, the crown symbolizes loyalty and the heart signifies love. You might come across the name 'love loyalty and friendship' ring, this is another name for the historic claddagh ring. The Irish had a group of rings that they labelled as 'friendship rings' and the claddagh was one of them. Each ring is custom made by skilled artisans and not mass produced. Every ring retains all the features present in the first ring made centuries ago. 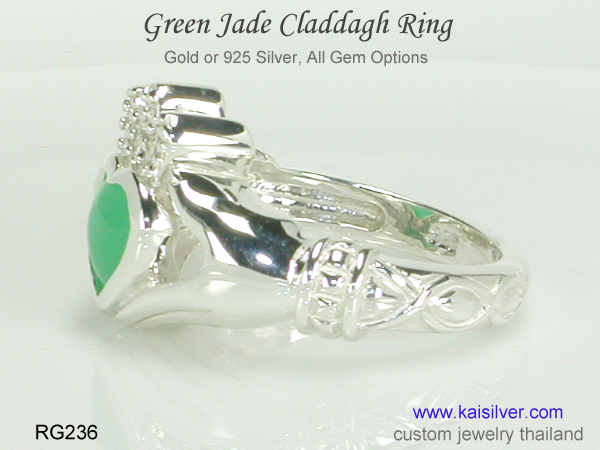 You can order a silver or gold claddagh green jade ring, choose from 14k or 18k gold. The ring has a minimum metal weight of around 10 grams, this makes it sturdy. You can request for a claddagh ring with a solid band and no scooping done inside. The gemstone is a 7-8mm natural green jade (jadeite) mined in Burma (Myanmar). You can choose the gemstone of your choice when placing an order. Since each ring is fully custom made, we can accommodate all ring size requests. We can craft a pair of claddagh rings for man and woman. If you trace the history of jade, you would go back in time by a few thousand years. The Chinese believed that green jade was the stone for good luck, good health and good fortune. Like many Chinese traditions, ancient beliefs in jade still live on. A major portion of the jadeite that is mined in Burma, heads for Chinese markets. You might be surprised to know that top quality jade (jadeite) can be as or even more, expensive than diamonds. Fortunately it is possible to get natural jadeite at modest prices. Reading the above paragraphs, you will observe that the claddagh ring and jade have a long history. The stylists at Kaisilver therefore decided to bring these two historic creations together. 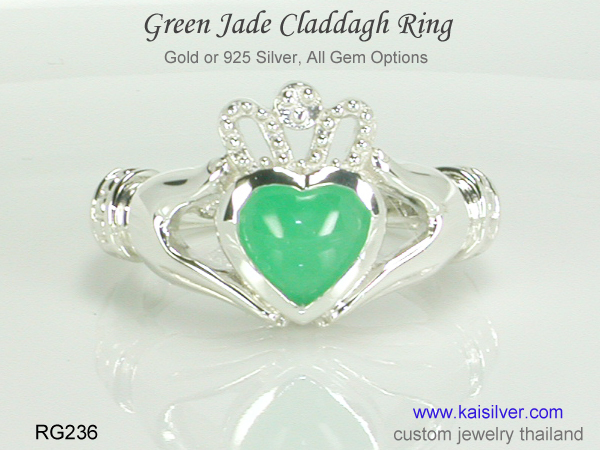 You can order a gold or 925 silver claddagh jade ring and rest assured, that the same superior quality standards will be applied for both metals. Green is an interesting color, it reminds us of nature and the mind never ceases to feel refreshed and soothed when it encounters any and every shade of green. In the world of gemstones, a green gem like jade will pair well with all metal colors. You could go for the classic look of sterling silver or choose, any of the three gold colors namely - white, yellow and pink. The Kaisilver claddagh ring is backed by a thorough research into the history and meaning of the jewel. We spent several months collecting information from Ireland, visiting various libraries in the country and talking to many scholars. Vital information that was gathered during this research, was used as design input. It is therefore no surprise that our ring is widely acclaimed as, the world's best rendition of the claddagh ring. Each ring is fully custom made by highly skilled artisans. Attention is given to every single detail to ensure that, every ring retains all the essential features of the first ring made 4 centuries ago. The first ring was made from gold and there was no gemstone in the jewel. We have added the concept of gemstones to add to the beauty and meaning of the claddagh ring. However if you wish to wear a gold or silver claddagh ring with no gemstone, let us know and we can make that jewel specifically for you. 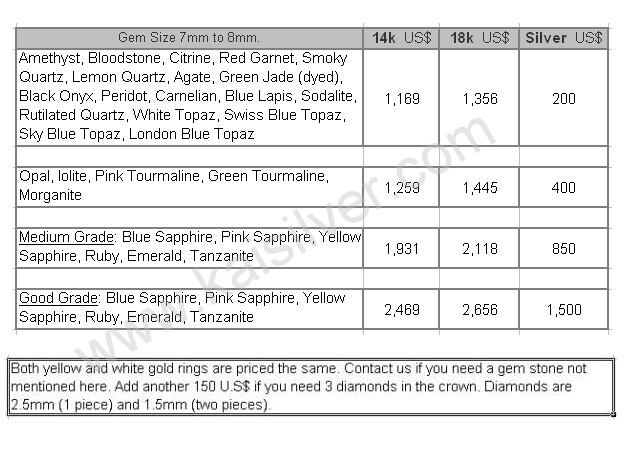 How To Buy: As the leading online provider of high end custom made jewelry from Thailand, we craft all types of jewelry in gold or 925 silver. Equal quality standards are maintained for both metals, you could pick a design from our website or send us your own design concept. We encourage you to discuss your requirements with our support team at sales@kaisilver.com . There is a production lead time of 4 to 6 weeks from the date of order confirmation and receipt of payment. We accept payment through Paypal and Western Union but, recommend Paypal if you are making a purchase for the first time. Let us know the mode of payment that you prefer, we will provide details for the same. I just received my ring and I had to send you a note of thanks. It is as beautiful as I expected it would be. Your patience with my questions was always gracious and the answers prompt and courteous. Please extend my thanks to the entire company and the artists who created this piece of art during extremely trying times for you. Feel free to use my endorsement of your company on your website, and I will be sure to tell everyone about your company. Thank you and God bless all of you ... Lynn St. Martin.